Our dining room is spacious and elegantly decorated and each room has its own table there. There is an excellent choice for breakfast, including a vast array of cereals, fruit & natural yogurts, fresh fruit, manderin oranges, grapefruit, cooked English Breakfast, toast with jams & marmalade and a variety of beverages. We currently don't have a guest lounge, but the dinning room is available during the day and evening to meet & relax. An en-suite family room on the ground floor with a rear aspect, tastefully decorated in olive greens and stone, with pine furniture and an easy chair. This room is also available as a twin. A first floor family room with a double and single bed, recently updated with a new en-suite. An en-suite double room on the first floor with a front aspect. A very light room with a ceiling to floor window from which to view Torquay. A bright and airy double en-suite room on the first floor. This is our only room with a bath, but it does also have a shower over. 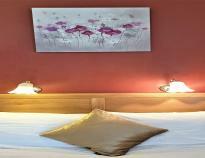 A superior double room on the second floor with a king-sized bed and new en-suite shower room. A front-facing double room on the second floor with a stylish brass bedstead and a new en-suite shower room. An adjustable wall-mounted flatscreen TV makes watching television a pleasure. 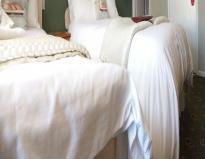 This newly refurbished en-suite family room can accommodate a family of four in its double and two single beds. It is a quiet room on the third floor over-looking the rear of the property. This ensuite twin room is at the front of the property on the third floor and has a fine view of Torquay. It contains a double and single bed and is available as a family room. An en-suite family room for three, or a twin room, with a comfortable faux leather two-seater sofa.. This, too, has an aspect to the front, over-looking Torquay's skyscape. 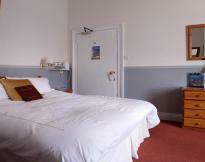 Double rooms can usually be let for single occupancy from £44 per night, including breakfast. (Please Note that one night stays are subject to payment of a non-returnable 50% deposit paid at the time of booking). 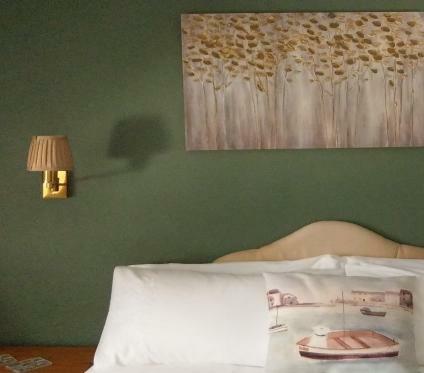 All rooms have flatscreen Freeview colour TVs, tea/coffee making facilities, hairdyers, irons and ironing boards, towels and complimentary toiletries. All prices are per room per night. All prices include breakfast.